Bamboo is a member of the Poaceae family of grasses. It is a tropical perennial that can grow up to 100 feet in height. There are two main types of bamboo:clumping and spreading. The spreading type grows by rhizomes and can become quite invasive. Most bamboo prefers warm weather but the hardy bamboo can survive Northwest winters. The plant needs moist, well-drained soil and can grow in either sun or part sun. Good drainage is a crucial element for the bamboo to prevent diseases of the root that cause rot. 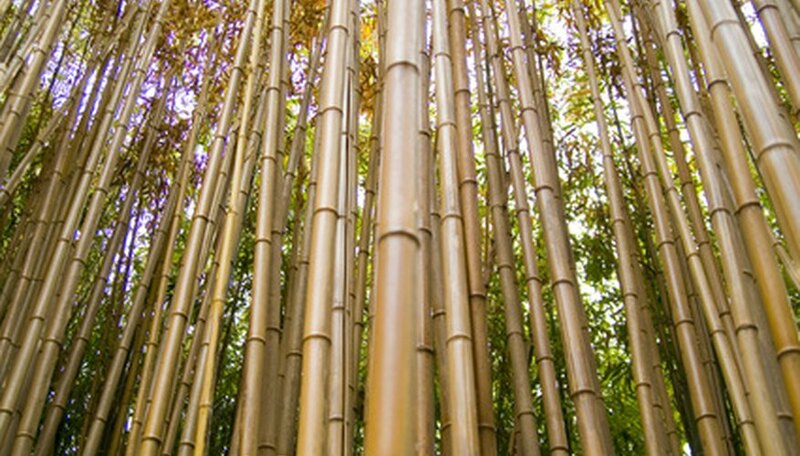 Bamboo can form short clumping shrubs or giant towering stands. Bamboo emerges from rhizomes, which have roots at the node end. The bamboo stalks are called culms. Clumping bamboo form from the rhizome called pachymorph and spring from nodes set close to the parent plant. The spreading or "running" bamboo arises from continuously growing rhizomes that spread under the soil. The rhizomes on running bamboo are long and slender and are termed leptomorphs. The culms are hollow and do not have a growth cambium or vascular system. The size of the culm is determined at sprouting and xylem and phloem tissues build the tube. Armillaria root rot is a fungus that infects central tissue and kills off the trunk and root of bamboo. The first sign that a bamboo has this root rot will be undersized and discolored leaves that will drop. Clumps of mushroom-like fungus will form at the base of the culm. There may be black or dark reddish brown root-like structures on top of the bamboo's rhizomes. The plant will need to be removed and the soil air dried before anything is replanted. Additionally any irrigation issues need to be addressed. The tender, edible shoots of bamboo can become black and die due to rhizome root rot. This disease attacks the rhizome but the first signs are on the bud. As the disease works on the rhizome, the roots will also turn black and die. Eventually the whole plant will yellow and leaves will fall off. The entire plant will die and the rhizomes will be unable to produce new shoots. Lucky bamboo are the little bamboo plants that are grown indoors. They are popular house plants but a variety of other bamboos are now being brought into the home. These plants generally need little extra care but do need light and plenty of water. Unfortunately this can cause the plant to be sitting in too much water and cause root rot. It is best to keep the bamboo dry between waterings especially in winter when it is not as actively growing. Once your plant has rot there is no way to save it. There are varieties of bamboo that are bred to be resistant to root rot. Care must be taken to only plant cuttings or starts from healthy stock or the disease will continue in the new plant. The soil in an infected area needs to be turned and dried in the sun. The sun will destroy the pathogens and sterilize the soil for replanting. Irrigation and drainage issues are a large cause of root rot. Bamboo rhizomes and roots that sit in water will decay after time. Sand or other gritty matter can be added to the soil to increase drainage. Bonnie Grant began writing professionally in 1990. She has been published on various websites, specializing in garden-related instructional articles. Grant recently earned a Bachelor of Arts in business management with a hospitality focus from South Seattle Community College. What Are Chemicals That Kill Bamboo?